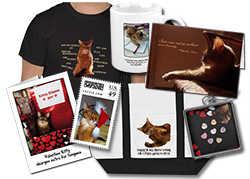 I think everybody wants to know how Binga is doing! Well, she came through the dental with no problems and was awake and up not long after it was done. My human picked up her up early that evening and brought her home. 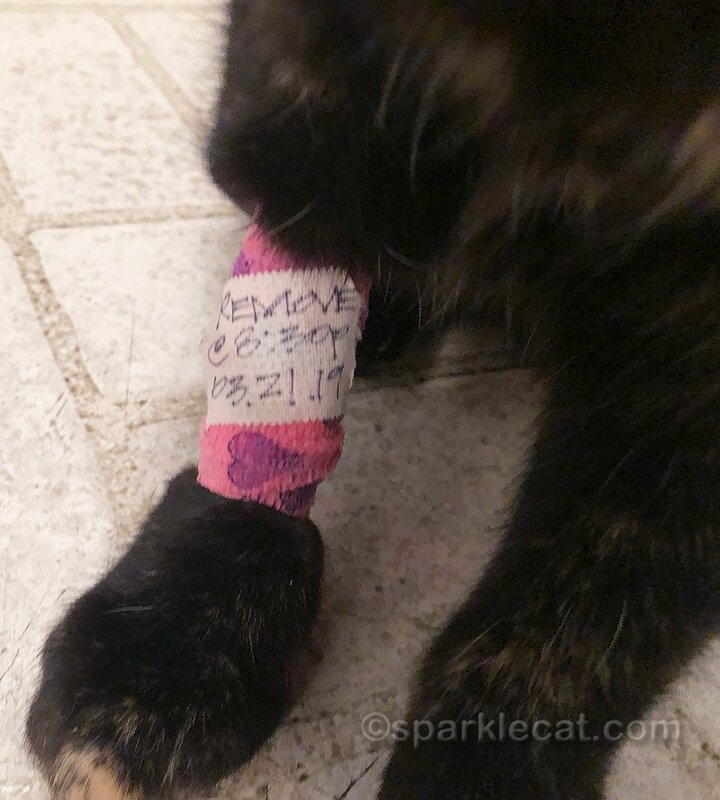 She was still wearing the bandage on her right paw. As you can tell, she wanted it off right away. She also was demanding food. She got neither. The vet said she had to keep the bandage on for a couple of hours. Binga thought this did not apply to her. Even though it said so right on her leg. And she couldn’t be fed right away either. She made her complaints known. When my human finally did get the bandage off she was grouchy about it. And she figured that since she missed breakfast, she should get three dinners to make up for it. Unfortunately, the vet said to only give her half dinner, so that’s what she got. Eventually she got the other half because she wouldn’t leave my human alone about it. By the next day she was back to normal, demanding food and attention. And plotting. You’d never guess she had just had dental surgery. Binga!! We are so glad you’re A-OK. We love you! Binga is not going to let that Dental stop her from being…Binga! I am so sorry I missed Binga’s original dental post but I am sooo happy she was back to herself immediately after. That is a GOOD thing!! Binga I know you’re glad to have THAT over with. Sorry you had to be starved after your procedure but your doctor knows best! Glad you’re doing so well….we were all worried for you. We should have known you would be the STAR that you are about it all! Yes, Binga, you Tortie Superbadass!!!! Glad to see you healthy and back to being your fabulous self. 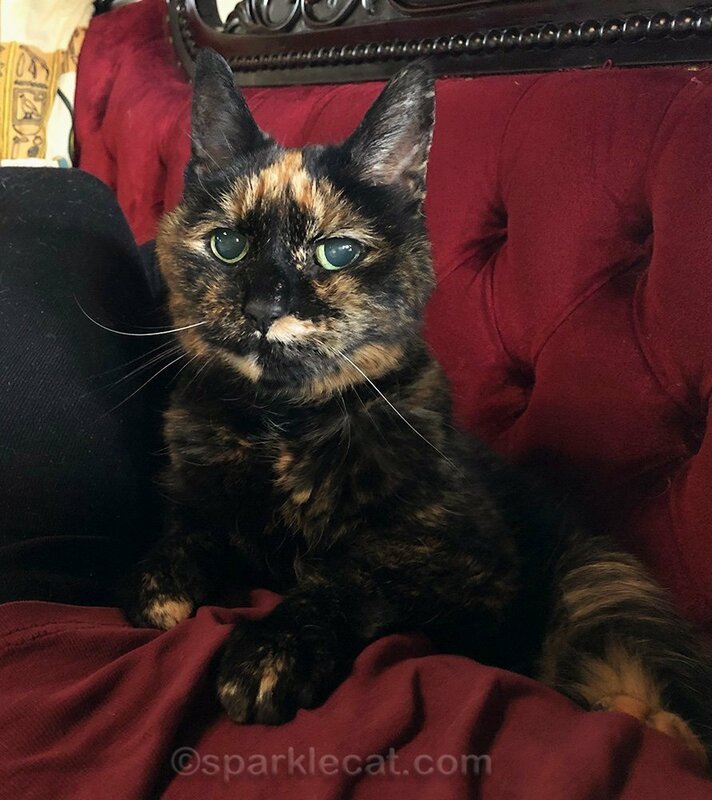 You might wonder what’s going on inside that Tortie mind, but really … aren’t you better off not knowing? Glad that you’re back to plotting, Binga! I’m so glad it’s done and she’s recovering well. Hugs to Binga. OH thank heavens! I am SO RELIEVED BINGA IS BACk and grouchy and grumpy and demanding and HOME! We’re glad to hear all went well for Binga. I’m so glad everything is okay, Binga! Good to hear. Miss Frankie is quite adept at getting bandages off and she stays grumpy for a loong time but BB, well he just enjoys all the good drugs they give and zones out for days! Binga is a trooper! Whoa! Since when can’t see eat right after an extraction—not that I’ve ever had one. We are glad to see Binga has recovered to full level of tortitude ! Binga thank goodness all that is over. You my friend are one tough Senior Lady and I’m so proud of how you are doing. And plotting, LOL! Binga, you are queen. I’m so glad all went so well! 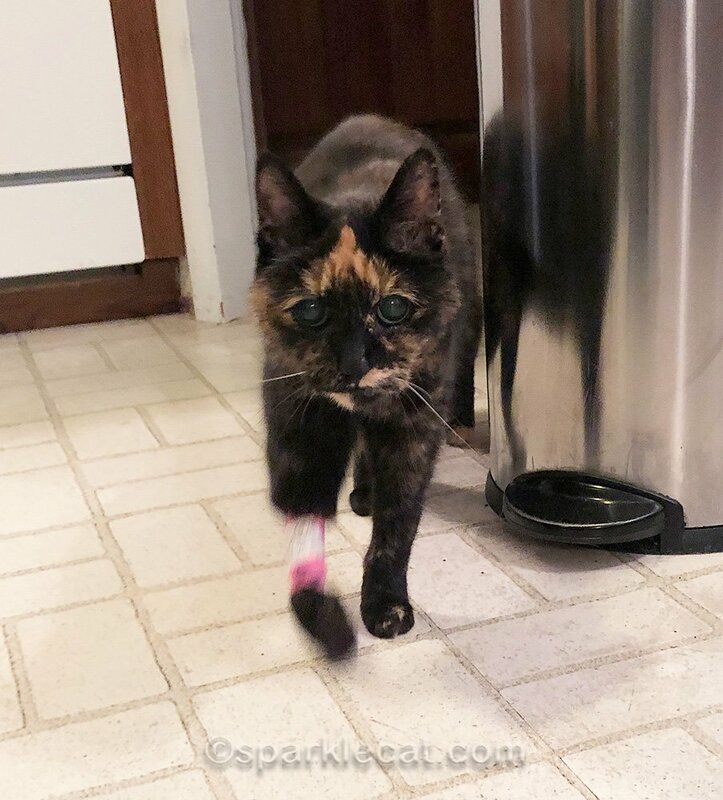 We are glad you are feeling better and back to plotting Binga! Binga, a big purrsonality like yours, doesn’t stay sedated for long! Poor Binga! Sounds like a hard day for you sweetie – we’re so glad everything went well. We’re really happy to hear that Binga’s dental went so well. IWe’re sure you are all relieved. 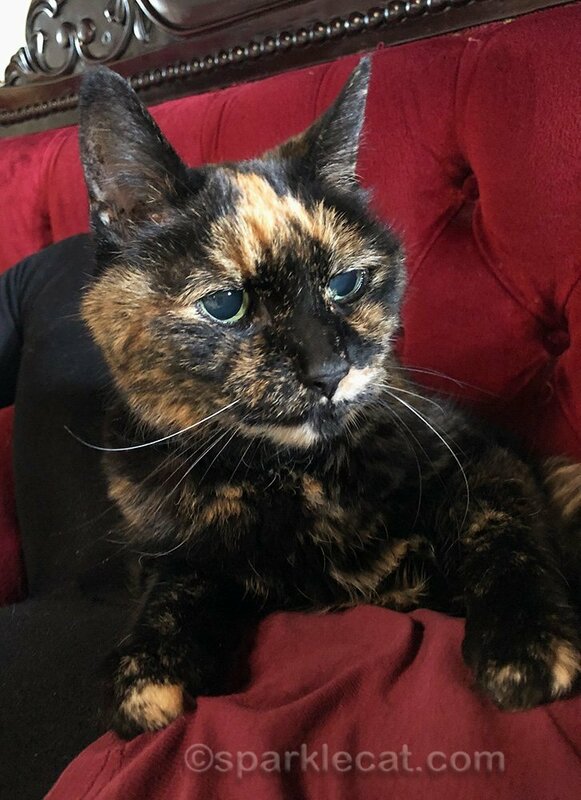 Yay, Binga’s back to her lovely tortie self. I had a tooth removal myself recently, and what a relief to get that done. Have a great week-end, girls! Sounds like she is back to her regular self again too ! That is such good news. Good for you Binga. Sure glad you are all right. Great to see Binga sailed through that dental procedure. 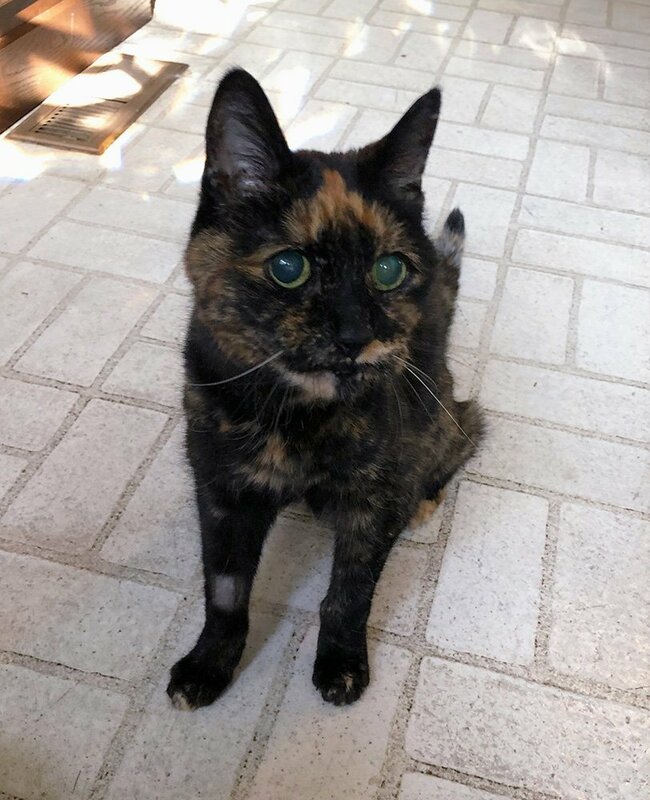 It’s like the vet who gave those post-op instructions knew nothing about torties. Glad all went well for Binga! What a trooper she is! Way to bounce back, Binga! 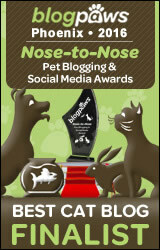 That’s absolutely wonderful, we’re all so glad that sweet Binga did so well. Fantastic news!!! We’re glad she’s back to her sassy self! As for the food post-dental, our biped has always given us small amounts as soon as we ask for it, and (knock on wood) we’ve never had any problems. Good on you Binga. I am a stroppy girl like you too and did the same thing after my dental surgery too. a lot better to have that bad tooth gone. Glad to see you back to normal, Binga. I am glad that Binga’s dental went well and she is back to normal. Anaesthetic is always a worry, particularly in their senior years. Eric always managed to get the bandage off within minutes of being home. Surprisingly, Flynn couldn’t have cared less about it. Awww, Binga is a Good Girl. I whined and cried so hard for food after my dental that the Human gave in and I got to eat pretty quick because you know they STARVE the kitty before the dental. Honestly, is all that really necessary???? Phffft.